An image of the sculpture Symphony in Three Forms on the campus of the University of Northern Iowa in Cedar Falls, Iowa. 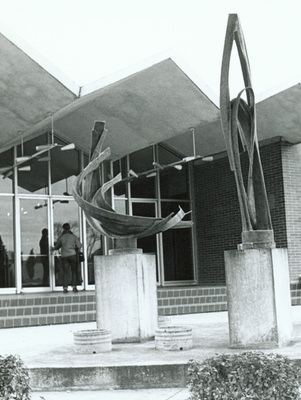 The sculpture by Don Finegan was installed in front of Russell Hall in 1960 and was removed then re-installed when the façade of the building was renovated. The medium is fiberglass, bronze, and copper. "Symphony entryway" (2019). Art on Campus Photographs. 19.